I’m very excited to share that I am officially bi-coastal and will be traveling back and forth from LA to NY! I have always wanted to live in New York, but never ended up making the move because of work and travel… then my sister moved there a few years ago and I decided to get the best of both worlds by visiting regularly throughout the year- it gave me my NY fix. But this year I decided I wanted to spend more time there and found an amazing apartment in the heart of Soho. 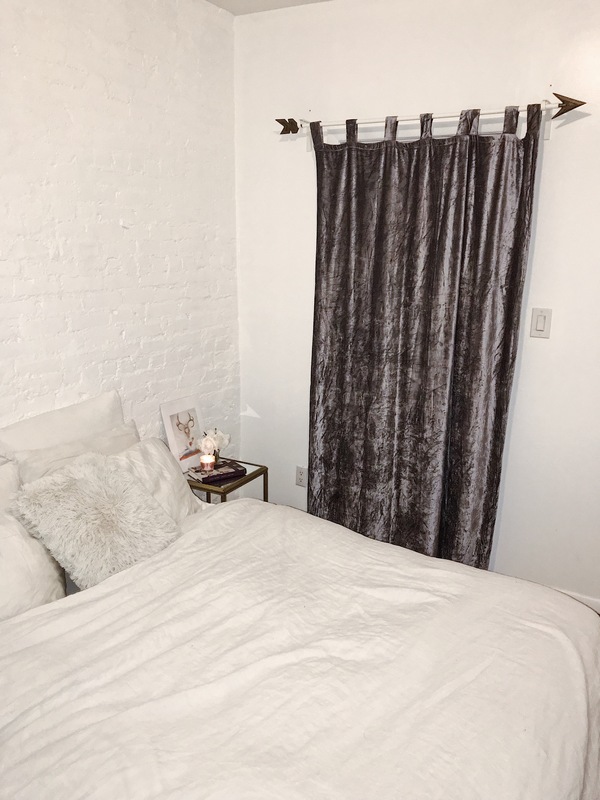 Apartment hunting in New York is stressful and a bit discouraging – you can see hundreds of apartments and every one has something missing. There’s really no such thing as the perfect NY apartment unless you want to spend a pretty penny – a very pretty penny. The apartment I found is perfect for what I need temporarily, and it couldn’t be in a more ideal location. You walk out my door and you’re in the heart of Soho with all the best shops and restaurants right next door. My favorite room is the living room, where I decided to be daring and add a pop of color and chose an aquamarine velour couch from Rove Concepts! I was going back and forth with the decision whether to keep my apartment all neutral or add the pop of color and I’m so happy I did! I think it really adds to my space and I absolutely love it. Another favorite piece is the white marble and gold coffee table I got from France & Son. It’s the perfect size and goes perfect in my living room.